There are 5 page templates built into Maker Pro for you to use. When adding a new page, on the right hand side, there is a drop down labeled “Template.” Click on it to display the five page template options. See lower right hand corner of the screenshot. The Default template displays a regular page with your sidebar. You can also change the layout settings to have the sidebar on the right or left, or full width. 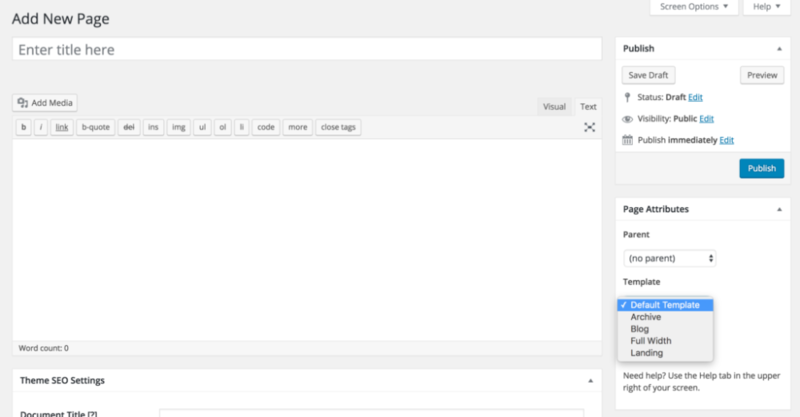 The Archive template displays your site map in a listed order of links. The Blog template displays your blog. The Landing page template removes the header, footer and many other elements to reveal a very minimal page.